On an October day in 1987 people in Las Vegas thought they were having an earthquake. Tremors rattled the city’s buildings. But this was not nature at work. This was an underground nuclear test explosion at the Nevada Test Site. Residents of Hattiesburg, Mississippi had their own similar experiences from underground nuclear tests. There have been over 1000 U.S. nuclear tests with severe public health consequences from radiation. And these nuke tests cost many billions of taxpayer dollars. Why would anyone want to relive those chapters of the Cold War? Instead, how about Senate Democrats and Republicans ratifying the Comprehensive Nuclear Test Ban Treaty (CTBT), which bans all nuclear test explosions. Now these two political parties working together may sound like a fairy tale. But history reveals that Dems and Reps, for the most part, have shared this goal of ending nuke testing. Ike and his team worked very hard to achieve a treaty ending nuclear testing. They contributed much research for building an international monitoring system to detect anyone cheating a treaty by setting off a secret nuclear explosion. But Kennedy needed to get the Senate to approve the treaty. Hearings began in August 1963. Secretary of State Dean Rusk was the leadoff witness. He emphasized how Democratic and Republican presidents have reasoned that “the risks of an unlimited nuclear race [are] far greater than those inherent in safeguarded progress toward arms control.” The Limited Test Ban Treaty was in the best interest of national security. Members of the Eisenhower administration rallied to help. Eisenhower wrote a letter to the Senate recommending passage of the Limited Test Ban Treaty. Ike’s science advisors, James Killian and George Kistiakowsky, signed a letter to the Senate, which was printed in newspapers. These scientists were part of the Citizens Committee for a Nuclear Test Ban, led by Eisenhower administration member James Wadsworth. Harold Stassen, Eisenhower’s disarmament advisor, gave testimony before the Senate advocating the test ban. 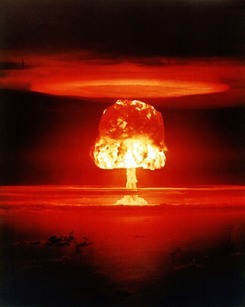 The Limited Test Ban Treaty was approved by the Senate in 1963. It was the first major nuclear arms control agreement with the Soviet Union.